Both suffer from disappointing brake pedals: the Model S has too much servo assistance, the I-Pace’s feels wooden. Both stop just fine. In 1949, De Havilland unveiled the world’s first jet-powered commercial aircraft and the world stood agog. It was a design that had seemingly jumped the fence from the future and arrived with an effortless three-point touch down in the present day. From that moment, everyone knew two things: the world of aviation would never be the same again, and Britain would rule it. Well, one out of two ain’t bad: the Comet did change the world, but its reign was short and problematic (to put it mildly). Meanwhile, over the water another company was looking on in interest, learning from the De Havilland’s mistakes, designing its own jet with the benefit of that hindsight. It was called the 707, it went into service nearly 10 years after the Comet first flew and Boeing has ruled the skies ever since. Sixty years later, the automotive world finds itself contemplating no less great an upheaval in its own future. Then as now we know the change is coming, and that for us the future is powered not by turbojets but electric motors. The difference now is that Britain’s been playing the waiting game while America blazed this brave new trail. And it’s been 10 years since a Tesla first went on sale, 10 years for Jaguar to contemplate what it got right and wrong in that time and prepare its response. And the I-Pace is it – not just Jaguar’s, nor even merely Britain’s, but Europe’s first large, all-purpose, premium electric family car. The opportunity to compare it with the inspired but now fully mature Tesla Model S was not one we could pass by. The limitations of both are immediately apparent. Really we’d like to have gone somewhere beautiful and green to compare these allegedly environmentally saintly cars, but the rigours of testing and taking probably 50 times more photographs than ever make it to the page meant we felt obliged to take the somewhat safer option of shooting them on a Surrey test track and the public roads around it. Remember that, whichever wins this comparison. Even the very best electric cars come with in-built limitations that, whatever the relative merits of one car versus another, remain the single biggest issue here. So before deciding whether you want a Tesla Model S or a Jaguar I-Pace, take an icily dispassionate look at your motoring needs, real-world range, charging times, the electrical infrastructure both here and abroad, and decide first whether you actually want an electric car at all. You do? Good. Then join me in the Tesla as we reacquaint ourselves with the car that has been not so much the standard setter as standard bearer for electric cars since its introduction in the summer of 2012. This is still an attractive car on the outside while the cabin remains dominated by that insanely wonderful 17in touchscreen. There really is nothing else like it out there, and given how long the Europeans have had to respond, one wonders why not. In here you get a sense of why it really is such an appropriate opponent for the I-Pace, far more so than the enormous Model X MPV. The Model S might be almost 300mm longer than the I-Pace, but it is the Jaguar with its vestigial overhangs that actually has the longer wheelbase. And interior packaging is very similar for both, at least for up to five adults. Each car is extremely comfortable with four on board, both could do with providing more space under their front seats for the feet of rear-seat passengers, and neither offers much to appeal to a fifth passenger on board. But it is the Tesla, with that extra length outside the wheelbase that provides convincingly the most luggage space and, of course, the (£3800) option of two additional rear-facing folding seats in the boot. 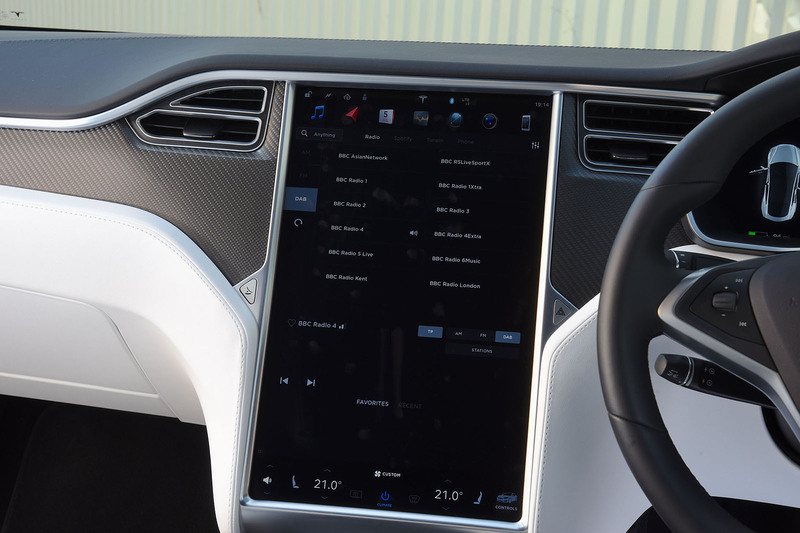 I really like the fact the Tesla is ‘live’ from the moment you get in: no need to turn a key or push a button – just tug down into ‘Drive’ on the rather out-of-place Mercedes-Benz gear selector, nudge the gas (figuratively speaking) and off you waft. Tesla now sells three versions of the Model S: the 100D, P100D (of ‘Ludicrous’ fame) and this more affordable 75D. At £66,730, it is directly competitive with the £63,495 first rung on the I-Pace ladder, but this very early press Jaguar is an entry-level 'S' model, albeit one equipped with plenty of extras from the options list and retailing for an altogether more punchy £82,685. Happily (and at least for the purposes of this comparison), all I-Paces have the same mechanical specification at launch, so there’s no guesswork to be done on the dynamic front. Both cars come with all-wheel drive, two electric motors to provide four-wheel drive, the Tesla with a 75kWh battery pack, the Jaguar with 90kWh. 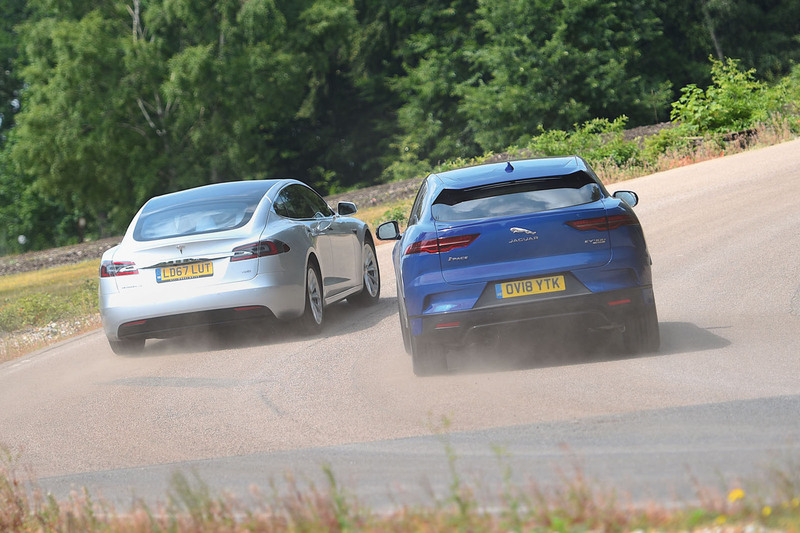 The Tesla produces 326bhp, which might sound a little thin next to the Jag’s 394bhp, but there is less than 0.5sec separating their relative 0-62mph times. Also bear in mind the Tesla comes with air suspension as standard while it’s only an option on the Jag. 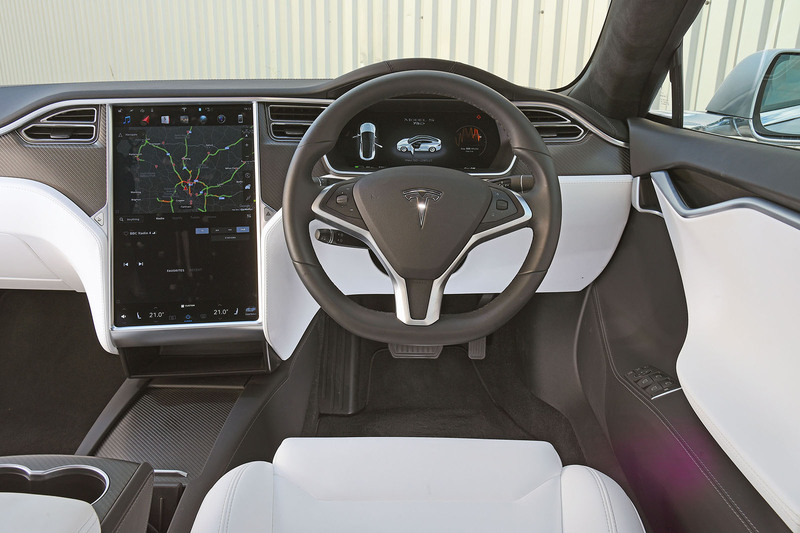 The Tesla’s most immediately obvious problem is that whatever sense of luxury it possesses has the air of being applied in the form of carbonfibre trim panels or that enormous screen, rather than designed in. And you don’t need to spend much time poking and prodding about before it leaves you with the impression that, fundamentally, it has been designed down to an altogether lower level of quality. Now we need to be careful here because the Jaguar’s interior feels very plush by comparison, but partly because it is a top-of- the-range model. However, it also has a far more pleasing design, and perceived quality that runs far deeper. Even before you’ve gone anywhere, its smart and distinctive presentation makes you feel good about your choice. Its particular problem is not the way its interior looks (though I can just hear the finance people saying the money’s run out so you have to have a nasty row of plastic buttons down low on the centre console) or, indeed, how it feels. It’s how it works. 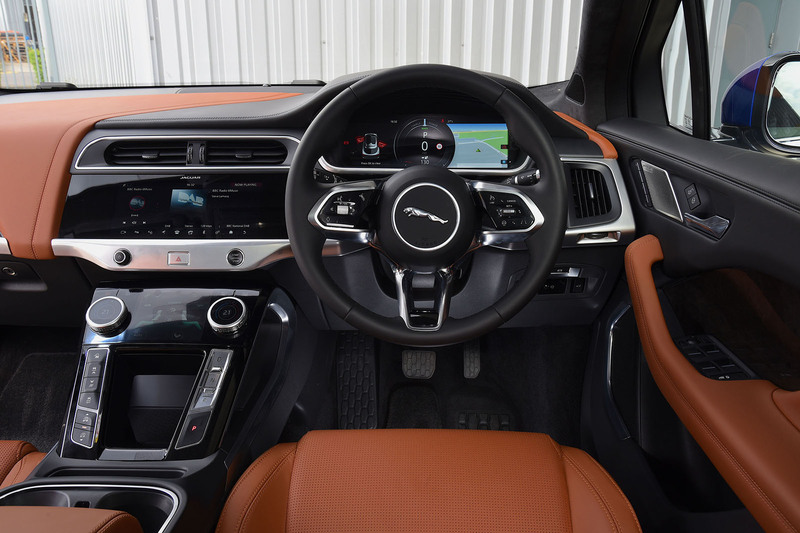 People used to Audi, BMW or Mercedes-Benz infotainment will only become truly aware of how brilliantly intuitive their systems are when they try Jaguar Land Rover’s equivalent. It looks funky and exciting but it’s difficult to understand and hard to operate even when you’ve spent many days trying. Such is the way that electric cars deliver their power, there’s an entire area of critical analysis with which motoring journalists need no longer bother. There’s no engine sound to savour, no gear ratios to ponder, no shift quality to question, no torque curve to examine. Both just go, immediately, with the same antiseptic whirring noise from their motors. Side-by-side comparisons suggest the Tesla might be a mote quicker off the line but essentially their performance is near enough the same, at least up to legal speeds. If you like the way electric cars perform, you’ll like both; if you don’t, you won’t like either. And that really is all there is to say on the subject. Happily, there is rather more to discuss when the road no longer runs straight – here, the I-Pace exists on a different plane to the Model S. The Tesla is quite grippy, but you are always aware of the car’s mass, which makes it feel slightly cumbersome. Also, the steering is accurate enough, but too light and almost entirely devoid of feel. This is a car you guide from place to place and, with the response of its electric motors, it’s a pretty rapid ground coverer. But fun? Not even close. I can see now why it was so important to do a car like the P100D, because it injects a degree of intrigue and entertainment this more modestly endowed Model S lacks entirely. The I-Pace makes no such mistakes. It corners flat and fast and does a far better job of disguising its mass. Despite its enormous wheelbase it actually feels quite wieldy, and if you’re going hard will quickly and precisely adjust its line in accordance with the instructions of your right foot. Of course, in this modern era you’re not allowed to discard the safety nets entirely, but for most people most of the time the car has such reserves of grip and composure that you’re not going to be going near the limit in any case. Best of all, the I-Pace actually has quite good steering, an even more crucial component of the driving experience because so much of the normal emotional connection to a car has been removed by the deletion of the internal combustion engine. Electric even as it is, the I-Pace is a proper driver’s car too, or at least as proper as you can reasonably expect a five- seat family car with a kerb weight on the porky side of two tonnes to be. Their respective ride qualities bring them closer together, but only because both are quite flawed, albeit for almost diametrically opposed reasons. 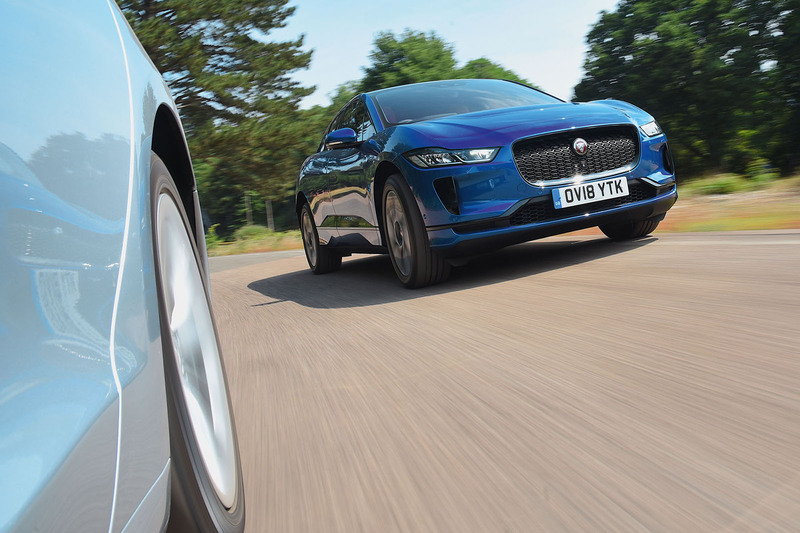 The Jaguar absorbs more low-speed lumps and bumps than the Tesla so initially feels more comfortable, but as speeds rise the Tesla allows its body to breathe more with the road, while the I-Pace then feels the need to check its body movements quite sharply and, some might say, abruptly. At higher effort levels, however, it’s this very primary control that should make I-Pace passengers feel less queasy than those in the Tesla when really motoring. After our day together, two key observations stood proud from this comparison. First is how well the Model S still stacks up after all these years in the market. True, it’s not really had any competition until now, but remember the company was little more than a start-up with the Lotus Elise-derived Roadster to its name when the S went on sale and now, six years later, it’s still capable, still credible, still desirable to those who choose to move this way. But the I-Pace has moved the game on and, given the amount of time JLR had to learn from the pioneering Tesla, it’s perhaps no more surprising than discovering a Boeing 707 made a rather better intercontinental airliner than a De Havilland Comet. Even so, the I-Pace is not only an excellent electric car but one of the better ones of any kind to which the famous leaper has been adhered in recent years – possibly even the best. Even taking the spec and price differences of these cars into account, it cannot be denied that while it is a little less practical and a lot less easy to operate, the I-Pace provides a more appealing space in which to pass the time, and a far more engaging driving experience on the way. Those who feared the all-electric future towards which we are inexorably moving would result in people pods of no discernible character or intrinsic desirability should be much encouraged by the I-Pace. For the truth is that in the absence of a conventional engine, design and driving dynamics become not less but far more important than ever. 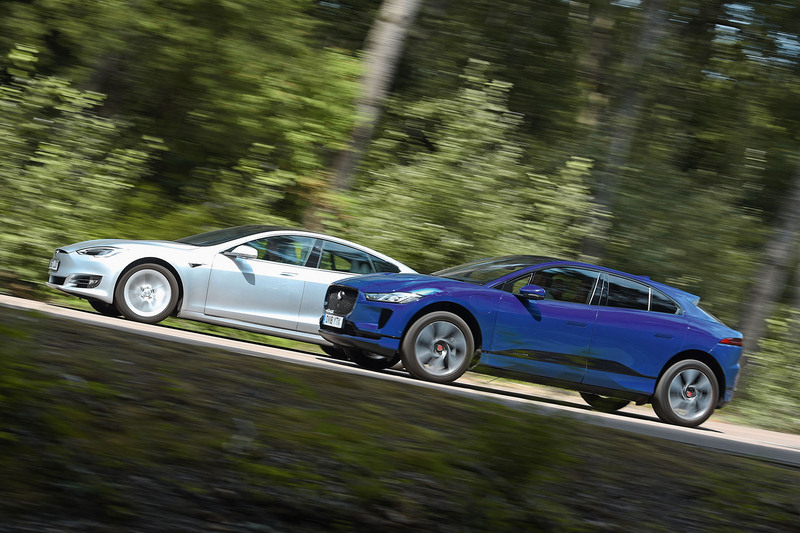 The I-Pace recognises this fact and delivers on the imperative behind it and, on the way, should help change not only the way we think about electric cars but Jaguar too. And for a brand that has struggled with its image for far too long, for those who love the British motor industry that could just be the best news of all. The majority of electric models arriving in the next couple of years are promising between 250 and 310 miles of range on one charge. Those include Volkswagen’s ID hatchback, Mercedes’ EQ C SUV and the Audi E-tron. But away from the mainstream, there are some bolder claims. The Fisker Emotion, designed by Henrik Fisker of BMW Z8 fame and on sale next year, should get a 400-plus-mile range, while the Faraday Future FF-91, also due in 2019, is claimed to offer 435 miles. Unsurprisingly, the boldest claim of all comes from Tesla’s Elon Musk. Its highly anticipated roadster, which is due in 2020, will travel 620 miles on a single charge, according to Musk, using a 200kWh battery. Tesla currently uses the largest battery on the market — 100kWh — although Rimac’s C_Two hypercar, which will go into production next year, adopts a 120kWh battery. While range is considered incredibly important to the uptake of electric vehicles, it will become less vital as more powerful charging points arrive, which means charging times of EVs will decrease. For example, the upcoming Audi E-tron will be the most advanced on the market when it launches: it is able to charge at 150kW (compared with the I-Pace’s 100kW), allowing it to reach 80% capacity in 30 minutes. You didn’t mention the Supercharger network ? Where do you charge the Jaguar ? For all Musk’s apparent failings he alone understood the need for a global rapid charging infrastructure, which has been admirably implemented and from what I’ve seen continues to be enhanced. We have several electric cars on our company fleet, the Tesla is the only one that can be properly used as a genuine and complete replacement to an IC propelled vehicle, the fact that you completely miss off this benefit in your test leaves me perplexed ? Some truth in that. There are a lot of non Tesla chargers out there now. Bit of a mixed bag depending on where you live.... government needs to sort this out and make all car makers work together on this against 1 standard. Most people in the UK/Europe would charge at home/work and use the i-pace for a sub 100 mile each way commute. When they take that occasional long trip they'll take their other car. But that'll change, it's a bit chicken & egg but as the market demands it the charging network will grow and that'll enable more EV use - further driving the growth, the growth of the charging infrastructure will accelerate and in 5 years it'll be a non-issue. But I expect the motorway services will price their EV charging excessively high, like they do with petrol/diesel, so it'll still be preferable to charge at home/work. Tesla had to build a charging infrastructure because they only sell EV's. Everyone else sells 99% (or more) petrol/diesel cars than they do EV's, so they can afford to drag their feet instead of lead the charge. Where Ford building petrol stations when the Model T first came along? No, so why is it imperative that Tesla have their own superchargers? To impress those that need everything handed to them on a plate - the typical thicko modern consumer. I just don't trust the Jag. Developed in a hurry and sure to have gremlins. I'd take the Tesla every time! Really? The Tesla has so many reported faults I’ve lost count. Does there Model X doors shut properly yet? Have they deal with all the bits that keep falling off their cars? I mean seriously go check out some reports online. No major car maker I can think of makes cars this bad built. Consumer reports has a great article somewhere. Then go check out where BMW, Audi and co have been finishing in league tables. Jaguar is at least comparable these days. Tesla aren’t so low down I can’t find them. Then go check out where BMW, Audi and co have been finishing in league tables. Jaguar is at least comparable these days. In the 2018 Quality survey by JD Power, Land Rover is last and Jaguar is second-last. Every other manufacturer is above them. Sure Jaguar is comparable, it just doesn't compare very well. I fully believe that the first buyers of Jaguar i-Pace will effectively become part of the development team and will spend alot of time reporting issues and failures back to headquarters. This is not correct, Jaguar finished above BMW, Audi and Volvo in the 2018 JD Power survey and Land Rover above BMW and Audi?? You poor soul. Those figures are for the US, they mean nothing here on our green and just shores.